Southern Magnolia Minerals all natural organic bare skincare makeup have been designed to help our customers achieve a "pure, beautiful, natural flawless you" look, effortlessly! 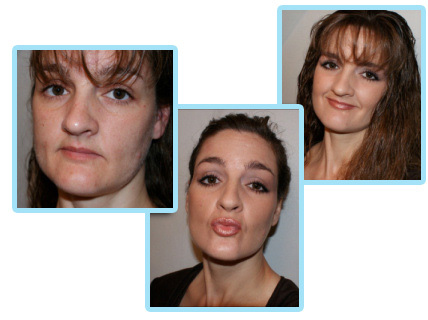 We hope that you'll enjoy these before and after photos, and will be inspired to get the look of bare, luminous, beautiful skin with Southern Magnolia mineral makeup! You can be minutes away from a flawless face! Are you a Southern Magnolia Mineral Cosmetics fan? 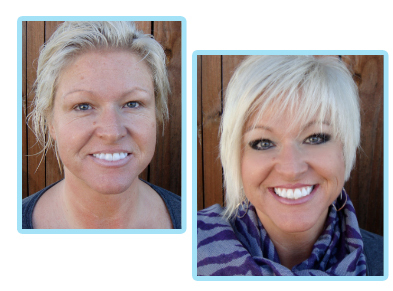 We'd love to feature your before and after photos in our gallery! Please contact us for more information. A video testimonial from our new customer, Faye S.
A video testimonial from our customer, Kola. Here's a Sneak Peek at Southern Magnolia Minerals Very Own Founder, Barb! Barb, I've got to say you have just got such a WONDERFUL array of color choices! I LOVE my new eye shadow and blush collection set! I must recommend them to everyone. I'm telling you, the photos are great, but they do the colors and textures NO JUSTICE! And I know that I would have missed out on my favorite colors had I not gotten the whole collection to toy around with (lol). Oh, and about the concealer and foundation minerals - Absolutely Perfect!!! 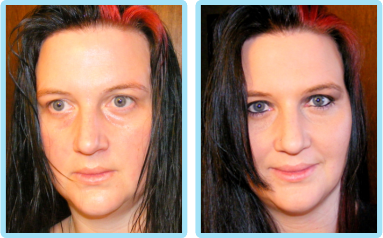 Most of the time my skin is rather clear, but it is a bit "uneven", I feel like an old maid without my makeup (see my 1st picture? I look sooo saggy and slouchy). 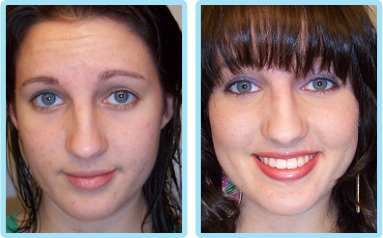 Your makeup has does wonders to create an even, fresh and young skin glow. I love it! What I want to share, above my love for my new mineral makeup, is my experience working with and for Barb, the owner of Southern Magnolia Minerals. There is just something uniquely different about Barb. She has such an enjoyable personality, yet her determination, hard work, and DEDICATION never cease to amaze me. I thought it very important for you to know that not only is the makeup great, but you truly can not beat Barbs wonderful and uniquely genuine customer service! I have to tell you how SMMCosmetics saved the day today :) [:)] I wasn't planning to go out today, so I skipped putting on makeup. Then I get a text from my daughter that her ride fell thru and she needed me to pick up her and her friends from the yogurt shop, asap. and then a brush of Mojave blush across the cheekbones. I put on some lip balm on the way out the door. Checked my look in the car mirror and I was impressed how SMMCosmetics could make me look "put together" in just one minute! For years, I have tried everything under the sun to try and match my skin tone. It's tough being fair-skinned, and everything else seemed to make me look like an oompa-loompa! Thank goodness I came across your website, because I will never try anything else! I'm always getting compliments about how lovely my make-up looks, and I don't hesitate to tell them where it came from. Hi Ya'll My name is Kriss!!! I'm a stay at home mother of 4 beautiful children. Georgia who is 12, Andrew is 10, Thayne is 4 and Belle is 23 months. I am a cancer survivor!!! I was given a gift of southern minerals early last year. 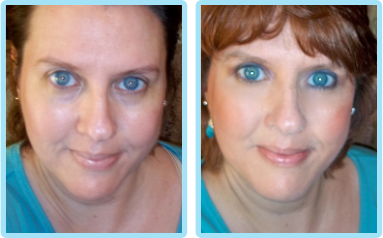 I had tried so many different things to cover dark circles and puffiness from the effects of treatment. I couldn't find anything. My mother in law bought me the southern minerals stuff in hopes that it would do something, anything to hide my marks. I was very skeptical and had just about given up trying to find something so my beauty would show on the outside like it was on the inside. Holy Moley was I shocked. Not only did I not have to wear a ton of goop on my face but just a little covered everything. I went to the cancer center one day wearing my new makeup and was talking to another mother that was there. She loved my makeup so much and had the same issues I did. I ended up giving her all my makeup(which I'm happy to report worked wonderfully for her as well) I have never had problem skin, but the effects of chemo sure did a number on my eyes. I used the yellow undereye cream concealer, well-rested concealer/shadow on my lids and over the cream concealer, and mint cream concealer on my red spots. Medium foundation, medium veil, coffeebean eyeliner, godiva, moody and bit o' honey eyeshadow. For those pictures I used a little bit of sun-kissed foundation and Beautifully Bare Skin Illuminizer Mineral Makeup Kit ( I gave it a try when it was on special on Groupon few months ago and use ever since :)). I'm wearing the perfection primer powder, eyelights concealing eye illuminator, medium foundation, camo lace radiance, pinky promise blush and one of your brown eye shadows called swiss java. Love it! My skin is pretty clear without the makeup, but the tone is somewhat uneven, and I have under eye circles. Because of the circles, even on the days I don't wear makeup, I never go out without some concealer under my eyes to balance that out. 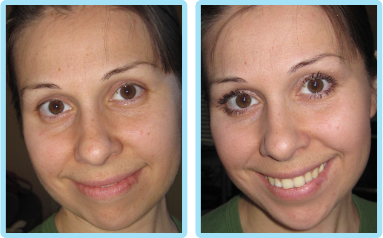 The Southern Minerals cover the imperfections and the dark circles disappear. I love the fact that the minerals are water-resistant. Even when I get a little sweaty, or the day is hot, my face still looks great! I use Pearl White Shadow combined withGolden Honey Warmth under my eyes, over my eyes in the dark parts near my nose, and a thin line down the center of my nose. I then apply Deep foundation with a kabuki brush. 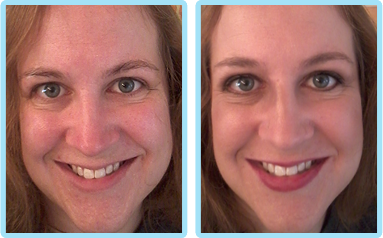 I use the Dare or Merlot Shadow as a blush (in this pic – the Dare). line my eyes with a Coffee Bean dark liner, and apply mascara, set the look with Tinted Resurfacing Veil to control oiliness. apply a neutral brown lipstick and then add some of my Dare Blush to create my own signature lip color. I LOVE these products. I have been using them for a few months. I wanted to see just how well they would stand up to the summer heat..WOW..the best ever!! I am a part time model and make up artists and photographers have asked me to bring my own foundation because they can't believe how well it covers! It's better than anything any of us have ever used. It lasts under heat, lights, and the wear of everyday. I can wear it on shoots and to school without feeling like my face has plaster on it. I wear the foundation powder in Be Fair, eye shadows in Blue Water, Daisy, and one that I have used so much it no longer has a label..lol. Honestly, this stuff is so great and so much better for the money than other stuff. Heather ordered samples of a few things back in the summer, and told us the story about her son being in a terrible accident, and losing another loved one. Things were tight with expenses and she had to make some concessions, and as happens to many women in similar circumstances she put her son first. When we heard her story we immediately wanted to help and decided to surprise her with a really nice "me time" care package along with her order. She has been a customer ever since, and will only wear Southern Magnolia Mineral products. It is stories like this that warm our hearts, and makes us feel soooo good and grateful about what we do! Barb, I wanted to share my before n after pictures. I love your product. I used the liquid foundation for the first time Saturday and let me tell you I love it. I don't usually wear foundation because they usually too heavy and my skin is very sensitive , This one is very light and look natural. I have several of your lipsticks too, I'm wearing Cherry Tart in my after! I just want you to know how addicted I am with your product. Miss Barb, thank you for your kind note! I love your products and with these products- I don't have a chicken neck! lol I also love the Instant Firm Skin Tight Facial Serum! I use it around my eyes, lips, and two areas around my chin; I know I'm a little long winded but I wanted to let you know that I have NEVER had a reaction using your products, even during chemo! And thanks for the free samples!!! I've always been a big makeup person. I've studied theatere makeup, hung out in New York, always have an idea to make myself and my friends look runway ready when we walk out the door. Of all the products I've used and tried, I never tried yours until my mother bought me one of your kits for my birthday. I just wanted to let you know how happy I am with your products. I originally thought I purchased bare minerals from you. I did go ahead and try their product as well and I hate it. I gave it away to my sister and I am so happy I found you on ebay. I since ordered "tan" and love it. I also wanted to tell you I received 2 emails from other ebay members asking if I liked your product before they tried it and I told them what I just told you!!!!!! Wanting to thank you, for making gluten free, chemical free. I have MS, since being diagnosed I can no longer wear certain makeup. My daughter found your products. I can only wear your make-up and lipsticks. Again thank you. I am a new cutomer for life. 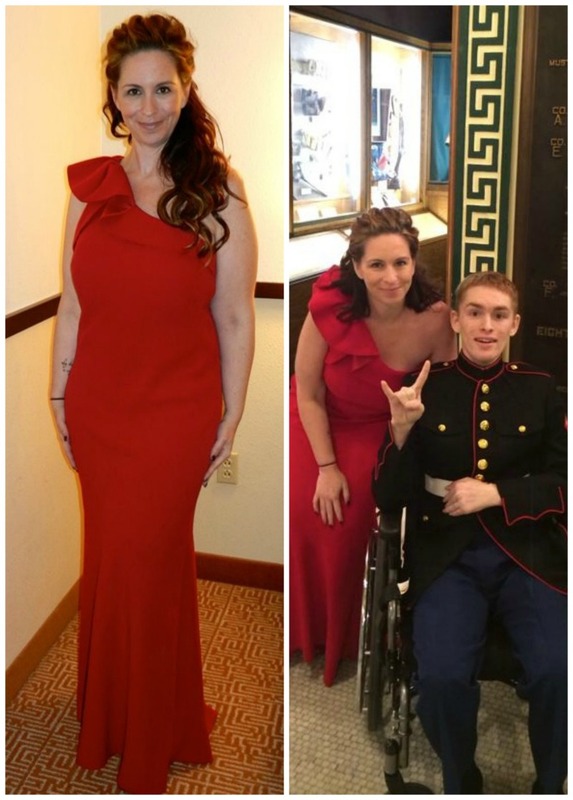 having MS changes your life in so many ways, but now I feel pretty again, and walk with my head held high... Lisa T.
Hi Barbara, I am a new customer to Southern Magnolia Minerals and just had to send you a quick email. I am originally from South Carolina and now live in California. Although I try not to be biased, my heart is still in the South! Therefore, when shopping online for my usual bare essetials I happened upon your website. I am so glad I did. I took a chance and jumped both feet in and bought a large kit. I am so glad I did. I love every product that was included. You have my business from now on and I am telling all of my friends about it. I have had comments about how well rested I am looking and I jump right in to tell them all about Southern Magnolia. Dear Barb, I had to write to say... Wow! I love everything in my kit...it all goes on so easily and my skin glows! Even on days when I'm a little rushed...a little concealer, foundation and Mojave blush and I'm set! What a godsend you and your products are. And to boot! you only have to use a little...I'm set for a while and so that gives me the opportunity to try your other products...Yippee! Thanks for the extras (iity bitty bukis are great and especially when I go on vacation). The foundations were so right on the money for my skintone.. .no countless mixing and messing around. Gush, gush...can't help it when it's the truth and it's good for you. My skin thanks you and my boyfriend and I thank you. Super Kudos to ya, Barb! Thank you for making such wonderful products! Thank you for great customer service and excellent shipping, even to Alaska. I'm glad I picked you to start my adventure in mineral makeup and skin care produts. When I was in my 20's I couldn't see much wrong or damage to my skin so I didn't take care of it much. As soon as I hit my 30's and had a child oh no! 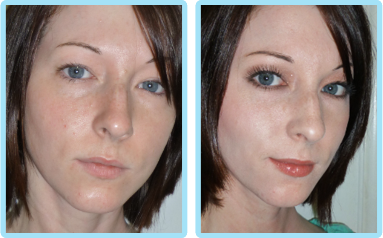 Sun damage, acne damage, large pores, fine lines, etc. Regular makeup looks fake on me. I have a hard time with foundation; I don't know what I'm doing and when I'm experimenting it's not very forgiving. I had enough and wanted to try mineral makeup. The expense made me leery. I'm not into paying for designer names and such. When I was looking on ebay something pulled me to your products. I liked how you educated yourself about cosmetics, your home based, and your customer service. I tried your "Ultimate Bare Beauty" kit. When I looked in the bathroom mirror I said "Oh Wow!". Even with my inexperence and not knowing what I am doing or how to do it the makeup made me look good. Even my husband says it looks good! I'm hooked, line and sinker! Now I'm trying the skin care products that I recieved to day. I'm happy and plan on being a life long customer. And am confident enough in your products to pass them on to my daughter when she is old enough and wants to start wearing makeup. She will start out with the best makeup. Thank you! Thank you! Thank you!